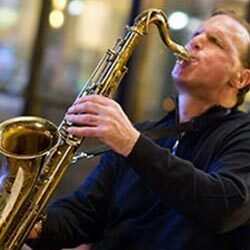 John’s Jazz Band (duo, trio, or quartet) is a versatile, straight-ahead jazz group formed in 1997 featuring some of the finest jazz musicians in Central New York. The group performs jazz standards from the Great American Songbook encompassing a wide spectrum of jazz styles including swing, Latin, ballad, bebop, blues, modal, and contemporary. The group has performed at over 300 engagements throughout Central New York including restaurant club dates, wedding reception cocktail hours, wine tastings, fundraisers, jazz festivals, jazz concerts, private events, and corporate functions.